Once again, Joan Druett shows her sure-footed understanding of a historical setting. You will taste, smell, feel every aspect of the England of this book! Told from the perspective of a smart young girl who observes everything keenly – even if she doesn’t understand it fully – this account of a family whose fortunes have suddenly been upended will charm and involve you. 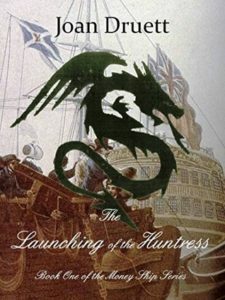 And the description of the Huntress’ launch will make you breathless! Disclosure: The publisher provided a review copy to me.